With long sunny days, Wimbledon on the tv and strawberries half price in the supermarkets, what could be better? How about a nice dollop of clotted cream? In our family we love nothing better than than afternoon tea with scones piled high with strawberry jam and clotted cream. So I was delighted when I was sent some Rodda’s Clotted Cream direct from the creamery and some facts about their busiest fortnight of the year. 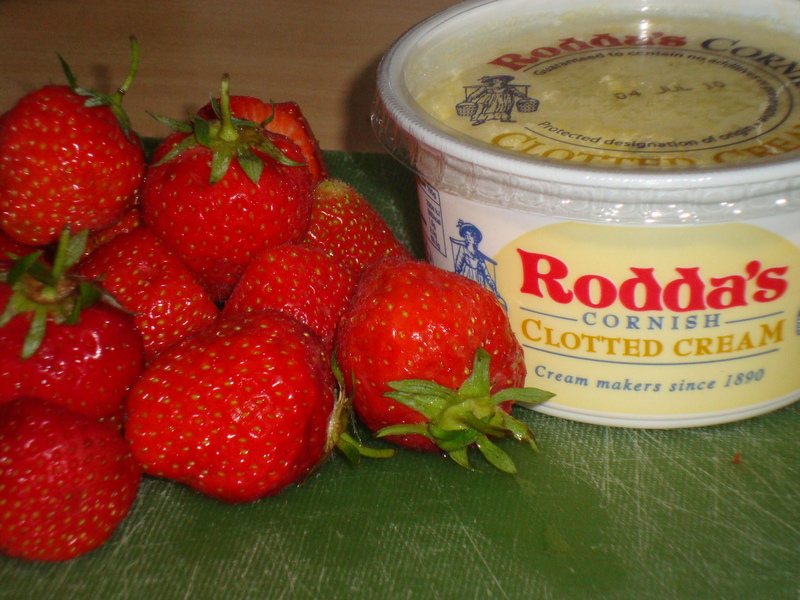 Did you know that during Wimbledon fortnight Rodda’s Cornish Clotted Cream sells enough pots to fill around 19 centre courts? That equates to around 4.5 million dollops of cream on a mountain of strawberries! Judging by the amount of strawberries we’ve bought recently, I think we’ve definitely contributed to that mountain. So, if you are partial to strawberries and clotted cream, like me, then here is an afternoon tea recipe for you to try out. It is best baked and eaten on the same day – what a good excuse to have an extra slice! 1. Preheat the oven to 200°C and grease a baking tray. I use a baking stone, which doesn’t need greasing, just a light dusting of flour. 2. Combine the flour, baking powder, salt, sugar and butter in a food processor and whizz up until it resembles fine breadcrumbs. You can also do this by hand by rubbing the fat into the flour and baking powder, then stirring in the salt and sugar. 3. Mix the egg with the milk then gradually add to the food processor while it is running. Add enough to form a soft dough. You might not need to add all the liquid. 4. Turn the dough onto a floured surface and knead for a few seconds. Roll out the dough into a 9 inch circle and slightly push down the centre to indent it. 5. Bake for around 15 minutes until the scone is risen and golden. Leave to cool. 6. When you are ready to serve, spread the top of the scone with strawberry jam, then clotted cream and finally sliced strawberries. Sprinkle with icing sugar and cut into wedges to serve. We’re off to the ‘pick your own’ soon to get some more strawberries. 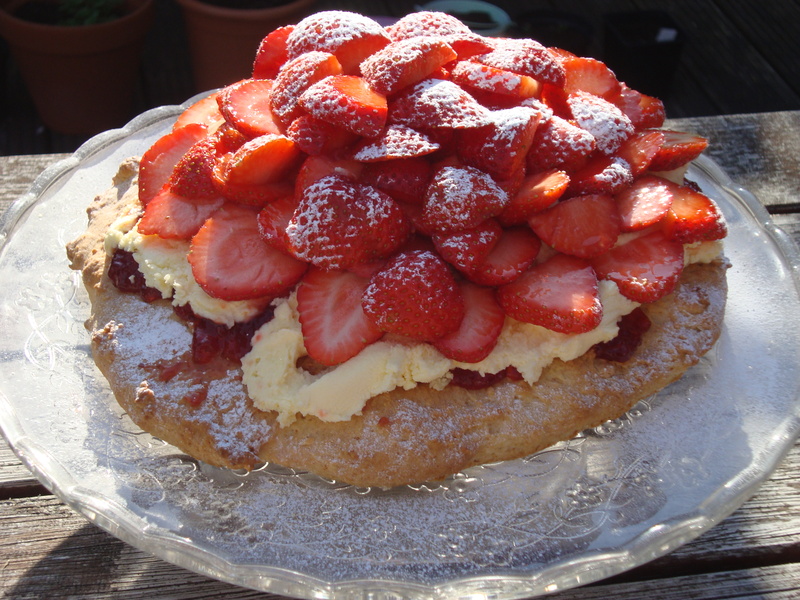 Enjoy your strawberries, cream and the tennis too, if you’re watching it! Oh my Christ! I need some of that NOW! Looks yum! 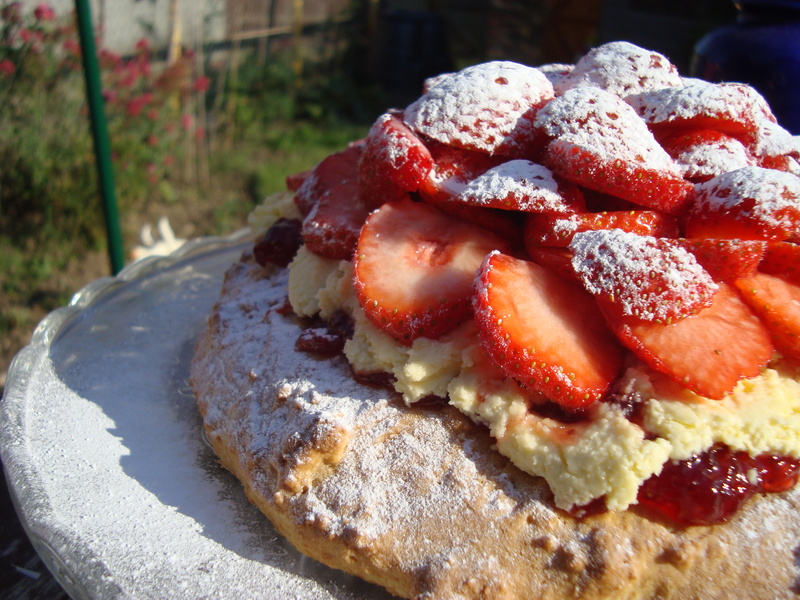 I hadn’t thought of baking a scone as one large cake but it really makes sense when you think about it, especially served this way! Your cakes are stunning – hope I bump into you on Saturday coz I’m dying to ask you about your business.